Know what I've been loving? (Why oh why am I sharing this Snapchat photo here ... it should be lost forever). The weekly black mask I've been doing. I typically put it on Tuesday or Wednesday nights, whenever I have about 30 minutes to lay in bed and let it work its magic. 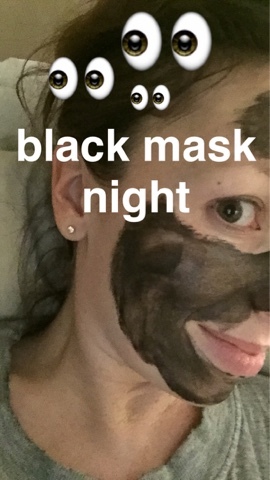 It's the Revision Black Mask and it makes my skin extremely smooth and dewy -- while promising to remove the toxins and impurities from it, too. It's nice to have something that I do for myself weekly, a little treat. One of our area's best hair and makeup artists (this sweet gal) recommended it, and I was sold. Last night I hosted supper club, and the whole meal was GREAT. I will share the menu early next week if you are looking for a failproof yet yummy meal plan to serve friends. One of the standouts last night was dessert (even I couldn't resist it). I made my very favorite pie, Chess Pie, and served it with a small bit of salted caramel gelato on the side. Recently, some girlfriends couldn't believe that I had never seen the show Fixer Upper on HGTV. I don't watch that channel very often, but they promised me that this was such a cute couple that I needed to check out. During Camille's nap yesterday, I watched two of the episodes while I prepped dinner. Y'all. They are such great hosts, such a cute couple, and they have such an EYE for design! I can't wait to watch more episodes and get some great inspiration for our next home! I have to share this photo because I was proud of my creativity last night! I made Camille a caprese salad of sorts, which was a fun way to mix up dinner. She had sliced grape tomatoes with sliced mozzarella string cheese, drizzled with a little bottled balsamic glaze (our grocery store, Harris Teeter, carries this -- it's their own line, HT Traders). It can be hard to break out of the normal toddler meal ruts, so this was fun for both of us. Lastly, a little teaser for a new all-natural household product delivery service, ePantry: oh my goodness. I received my first shipment of products this week, and I don't think I've ever been so excited to clean countertops. 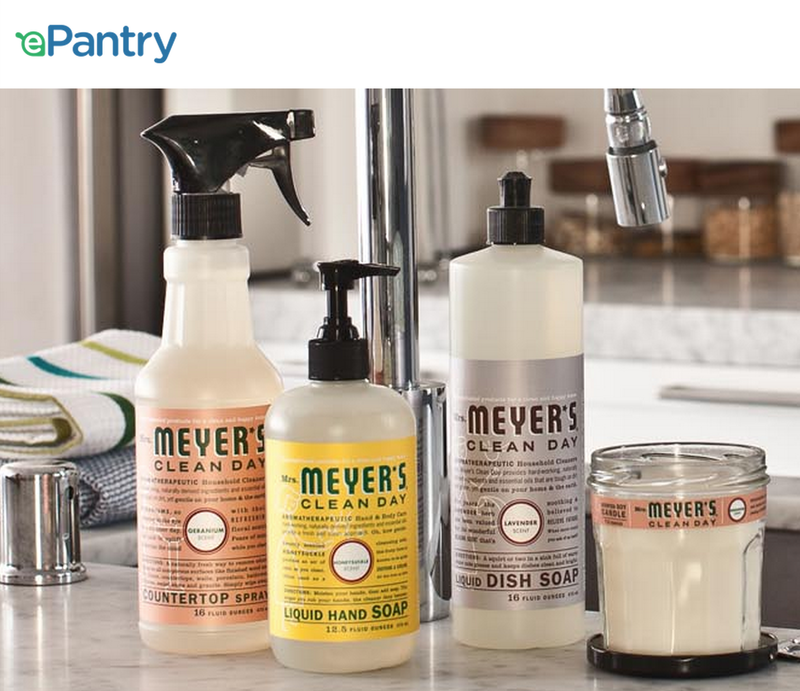 Normally I'd just pick up my cleaning products at Target or on Amazon, but I've been working on a little price comparison for you and ePantry is coming up ahead of the others. I'll share more with you about my experience next week, but if you want to check it out now, you can use my referral link HERE to get your first $10 in items for free (and new customers get free shipping on their first order)! The link up isn't showing on your page? Maybe it is just me. I love that Balsamic Glaze, Trader Joe's makes one I like too. Try it on steak. YUM. That Chess Pie is beautiful! I love Fixer Upper!!! Their store in Waco is amazing! Have a great weekend. Toddler caprese salad- brilliant! My daughter is already obsessed with grape tomatoes. Thank you for the idea! I am amazed at what you get Camille to eat! 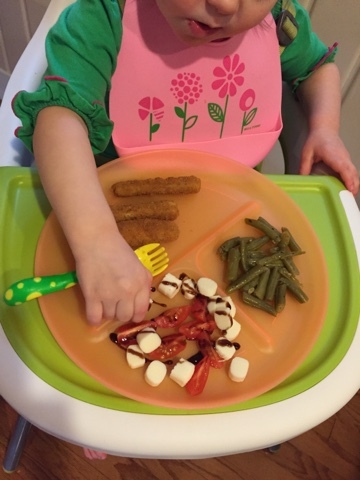 I can't get my toddler to even touch a chicken nugget let alone green beans and tomatoes. Can't wait to read what you have to say about epantry....great idea!! We LOVE "Fixer Upper" in our house! My husband and I both went to Baylor and it's fun to see the shots of Waco and Baylor they show on there. 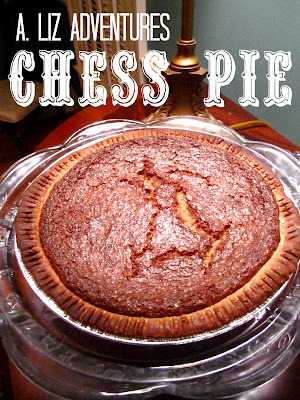 Chess Pie is one of my favorites! I always make it at Easter; yum! And I can't believe Camille ate that; that's AWESOME! My toddler is so picky, but I should definitely try that! I love Revision! My uncle works for them and gets us all of their products to try! Nectifirm is great, too! I will have to check out that mask. I'm on maternity leave and happened upon a marathon of Fixer Upper a few weeks ago and became an instant fan! They are just too cute. I'm convinced I could just tell them the neighborhood I wanted to be in and give them a few words about my style and come back when they were done and I'd love the house and interior even if I didn't get to pick the house. Chip and Jojo are the best!! They make me want to move to Waco just so they can fix a house for me :) Have a great weekend! Oh my gosh, I'm so glad your friends convinced you to watch Fixer Upper! I'm obsessed with that show. It makes me want to move to Waco JUST so they can do a house for me. I LOVE Jo's style and I love them together! Careful, you'll be hooked! I, too, posted about fixer upper today! Love them and shiplap! LOVE Camille's cute little gourmet meal!! You always do such a great job feeding her such healthy and creative meals!! And I am going to show my Northerner roots here- but I have only heard of Chess Pie when you have mentioned it previous posts AND I have no idea what it is! HA! Sounds absolutely delicious though along with some carmel gelato! Hope you have a great weekend friend! I must be the last person not watching fixer upper! I really should though because it's right up my alley! 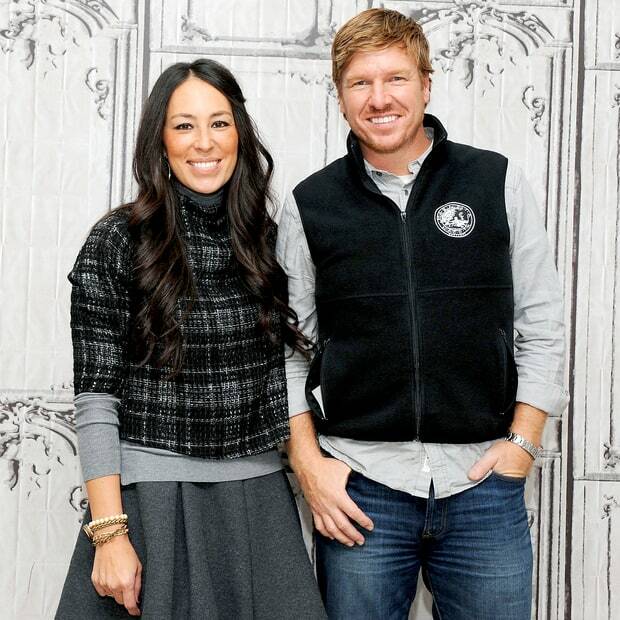 I've never watched Fixer Upper< either - I'll have to check it out! I could definitely use a good face mask! That one reminds me a little of the Dark Angels face scrub from Lush. LOVE that stuff! I always love doing face masks so I'll have to check this one out! Chocolate Chess pie is also my fave! I love me a good face mask. I like to do mine on Sunday nights. I have this great one mixed with apple cider vinegar & it's super fantastic! LOVE IT! I've been using Boscia's black mask - my favorite part is peeling it off. You can't miss any of it! OMG girl, how had you never seen Fixer Upper?!?! Glad you are finally hooked like the rest of us :) And love that baby caprese meal...I'm going to have to make that for Ella! I've never seen Fixer Upper either... we have so many other shows that we watch, I just don't have time for another one! Hubs and I used to watch HGTV nonstop before we built our house, but now that we're all settled into the house that we love, I don't really feel a need to watch it as much anymore! Fixer Upper and The Walking Dead are the only two shows I have to watch each week. My husband makes caprese lunches for our daughter! Especially in the summer when we grow the tomatoes and basil fresh in our backyard. Fixer Upper is my favorite!!! I have to decide a lot between going on a run, or watching the show. Last week I couldn't decide so I made up a fixer upper workout haha. What a fun toddler meal you made, and I love Fixer Upper! Aren't they such a cute couple? I've been all about the masks recently! I have found a few at Target that I rotate through, and my favorite part is that they offer "sample" sizes for $2 each, so I can try them out before I invest in a whole jar of the stuff. I am going to have to put that black mask on my "to try" list! TGIF! I didn't join along this week in lieu of a Sully's 10 month "birthday," but I've been loving Five on Friday. I'll never forget when the Fixer Upper pilot came on (because I'm addicted to HGTV) and I recorded it and made Ryan watch it immediately, we were hooked. I'm going to have to try that mask, looks awesome! Ahh, my hubby and I just binge watched all the available episodes of Fixer Upper on Netflix! SO good! I may have to try out that mask, too. Happy weekend!